Before/while/after writing the “Is Brazil the Mother or Father of Capoeira?” post, I had some tiny, niggling misgivings about it at the back of my mind, but ignored them for the sake of the post and saying what I wanted to say about the metaphor. However, the more I thought about it, the less comfortable and the more, well, intellectually dishonest it seemed to just leave it, especially when what was bothering me stood out even more clearly with Xixarro’s first comment and then my own response to it. So, I’m going to distill all those thoughts out now. In the post itself, I noted how the original metaphor and my rationale for its correction were based on stereotypes, something I’ve touched on before here. Thus, the first problem: was I reinforcing those stereotypes by bringing it all up, and basing my rationale on them? The second problem: I felt it was feminist to advocate for Brazil as the mother of capoeira rather than as the father (in addition to it being first and foremost logical, of course). But I was relying on (and so possibly reinforcing) gender stereotypes in order to make that advocation. So then wasn’t that counterproductive, and maybe even hypocritical, feminism-wise? Then, there was the idea that capoeira is “masculine”, so therefore of course Brazil would be the “masculine” partner as well, and the idea that of course the country that’s the most majorly/obviously associated with or seemed to play the biggest part in something (in this case, capoeira) would be the “male”. So, my objection was in order to deconstruct the seeming hypocrisy and system of thought there. As for reinforcing the stereotypes…I actually realized just how entrenched they were even as I started writing this post: “in addition to it being first and foremost logical”, I wrote, referring to my “correction”. Well, the only reason I found it “logical” in the first place was because my premises were the very stereotypes I was trying to deconstruct! It all became even more obvious and more uncomfortable when Xixarro made his comment and I replied to it, and I realized I’d somehow gone from arguing against stereotypes to arguing for which stereotypes seemed more “right”! In truth, no stereotypes are right, let alone “logical”—by definition! It’s not logical that woman = childrearer or = background/minor role*, and it’s not logical that man = leader/fountainhead/major role. Again, those are all purely social, (hu)man-made constructions. Somebody just upped and decided those things, with really no basis whatsoever except for his own inflated superiority complex. So, in conclusion: While I relied on stereotypes to make my argument against one instance of (mis)use of stereotypes, at least I recognized that I was doing it, and then went on (in this post) to deconstruct those stereotypes themselves. And hopefully, this provided a good case study for you in the recognition and disconstruction of stereotypes, whether as obvious statements or as subtle underlying premises in yourself! Oops, I commented on the previous post before I saw this one. I’d just like to point out a small technicality though – it IS logical that women are seen as “childbearers” – since they do, in fact, bear children (though, obviously, not without some male contribution :-p) but “childbearer” does not equal “background or minor role.” I know you didn’t actually say this, but I thought it’s worth pointing out. In fact, a pretty good case could be made for the opposite (childbearing/rearing being a more important role than many other endeavors). Unfortunately in the feminist debate it sometimes gets boiled down to just two options: either “barefoot and pregnant in the kitchen” or “career woman who has ‘risen’ past the inferior role of motherhood” – but I really think the most liberating form of feminism is one that affirms women’s choices whatever they choose to be – maybe it’s being childless, maybe it’s having both a career and kids, maybe it’s having a dozen children and being a housewife, maybe it’s working from home, maybe it’s adopting… the important thing is that none of these choices – either the “modern” one of career-woman or the “traditional” one of housewife – is exalted as the superior choice or denigrated as the inferior choice. All of them should be understood as valuable, and women should be free to choose which path they want to take. Haha, yes it’s more than logical that women are seen as childbearers since that’s actually a physical fact! But childrearing, I’d say, should be something that can be attributed to either gender, so I only mentioned childrearing in the post, rather than childbearing. You’re right though, about the implying “childrearer” seemed to be equated with background and minor in how I wrote it, and I definitely didn’t mean it that way! Or perhaps I meant to evoke that many people see it that way–even, as you pointed out, other feminists. That is, both men and other women often discount or dismiss the work of stay-at-home mothers or housewives as not doing “real work”, even though they’re raising the generation of tomorrow! And I also fully agree with what you said about the bottom line being about affirming a woman’s choice, no matter what it is. I think I’ll amend that part in my post, just to avoid future confusion. Thanks for bringing it up! Joaninha, This article was thought provoking. I feel too much emphasis is, in the general world, put upon being politically correct. 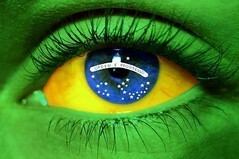 It sounds quite logical to me to have stated Brazil is the mother of capoeira, in the sense that you stated it. I think of countries as feminine. Much as ships are gendered female. I wouldn’t worry about whether or not you relied upon a stereotype or not. You made a statement that many may or may not agree with. I, for one, woudn’t have even had a second thought. All in all, your writing is well done and I like the thought process behind your words. i’m going to read your archives. Thanks so much for dropping by and checking out my stuff! The dawn of colonialism, the rise of Samory and the Forces of Manding. As kingdom upon African kingdom fell before the military might of the Colonial French Empire, Manding sounded its thunderous war drums and its armies prepared for war. This is the story of the Mandingo Empire and its triumphant and victorious march into the pages of history. Forces of Manding includes 98 pages of unprecedented ritual, artifacts, battle tactics, weaponry, traditional uniforms of the period, traditional combat (armed and unarmed), and more..